For many years I have had a love affair with eating raw (or preserved/cured) fish. The first experience I remember had to have been smoked salmon. I was introduced to it as a topping for my bagel. Of course cream cheese and red onion were the accompaniment. As my interest in food and cooking grew,first into a passion, later into a career I took every opportunity to acquaint myself with the various forms that raw fish took. Oysters and clams on the half shell were always a treat. When I discovered Sushi, a love affair I maintain to this day, no type of fish was off limits. Sea urchin,octopus,tuna,yellowtail were all favorites of mine. Back in the early 1980’s, thanks to a free flight from an air freight company, I found myself in Los Angeles California with a week to kill.Being young and foolish I decided that I would continue my west coast adventure by making my way down into Mexico. I really had no idea what I would do when I got there but it seemed like a good idea at the time. I began by taking a bus down to San Diego, followed by a trolley ride to the border of Mexico and finally,another bus ride, on to Ensenada, Mexico. Getting off the bus I began to wander around. I couldn’t help notice all food vendors around town. I also learned two important facts. The first was that my high school Spanish lessons didn’t prepare me for communicating with the folks in Mexico and the second was that the Mexican food I had eaten growing up in New Jersey was different than what was being sold on the streets of Ensenada. It was here that I had my first taste of Ceviche. The fish was very fresh due to the fact that Ensenada was a fishing port. Mixed to order with lime juice, onion,cucumber,Chile pepper,tomato and cilantro it was presented in little paper cups with a slice of avocado on top. The results were outstanding! Between the ceviche and the fresh lobster that seemed to be everywhere I ate very well that week.After returning to the U.S. I didn’t have ceviche again for many years. When I moved to Detroit Michigan in the late 1980’s I learned that there was neighborhood called Mexican Town in Southwest Detroit and although my wife and I went and ate out there the menu selections were, once again, watered down for American tastes and it remained that way for a long time. At some point, however, tastes changed and authentic Mexican recipes began appearing on menus. It wasn’t really new. It was just that it was only being enjoyed in Mexican households. Then something new happened. Real, authentic Mexican fare began appearing in Detroit. Taco trucks were the first to serve up authentic Mexican fare.Tacos with various fillings (beef,pork,chicken,tongue etc…) were available. Also,something I hadn’t had in years, Ceviche de Tostada.This was a fried corn tortilla (tostada) topped with the same Ceviche I had had so many years before. I was thrilled! Today is Cinco de Mayo (Mexican Independence Day). This holiday celebrates the victory of Mexican forces over the French at the Battle of Puebla in 1862. While not a major holiday in the country of Mexico Mexican communities in the United States celebrate with great enthusiasm. Here in Detroit”s Mexican Town the streets are overflowing as parades, commemorative events and general celebration are the order of the day. 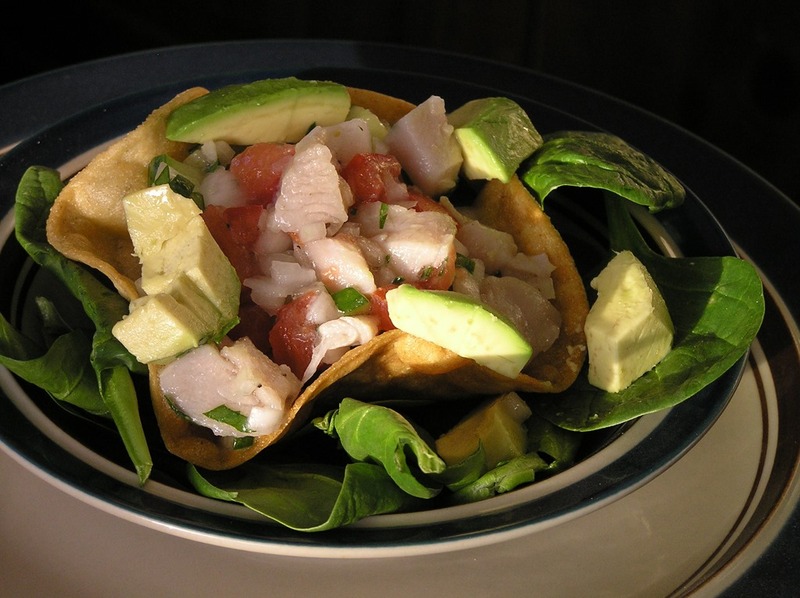 In memory of that first taste of Ceviche I had in Mexico,so many years ago,as well as the Cinco de Mayo celebration, I decided to make Tostada de Ceviche. While any fish or shellfish can be used I chose mahi-mahi as my protein. Lime juice,olive oil,cucumber,onion, tomato and garlic dressed the fish. For my tostada I used a white corn tortilla and fried it in order to create a bowl by placing a ladle in the center and allowing the tortilla to curl up around it. The trick, I found, was to not marinate the fish for too long. 2. Mix diced fish and Lime juice in a non reactive bowl. Plastic works fine. 3.Marinate for approximately 30- 40 minutes. Do not over marinate. Fish should be white and firm but not dry. 4. Add remaining ingredients and marinate for an additional 5 minutes. 5. Using a slotted spoon to drain some of the juice spoon the fish mixture into/onto the fried tortilla shells. Traditionally diced jalapeno peppers are added for heat. I omit them here. Ketchup or hot sauce is also traditional. Again, I omit it. Any fish or shellfish can be used although I find a mild white flesh fish works best. Thanks for leaving a comment on my blog. Didn’t realize you were back to your blog! Nice to hear from you Ed. Reading this made me really happy (and hungry). Great post! And the photograph is excellent oo.